Opening our Jazz Festival weekend at the Gibsons Heritage Playhouse, is Dan Brubeck and his fabulous, world-class jazz quartet featuring Dan on drums, Adam Thomas on vocals and bass, Steve Kaldestad on sax, and Tony Foster on piano. 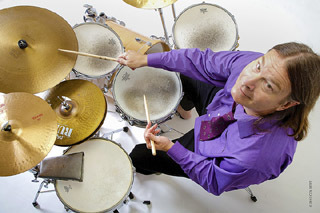 For many years Dan Brubeck, son of jazz icon Dave Brubeck has wanted to put together a musical tribute that honored both his father's compositions and his mother's lyrics. It is a little known fact that there was a creative partnership between Dave & Iola Brubeck, his wife of 71 years. Iola's lyrics have been performed by such greats as Louis Armstrong, Carmen McRea, Diane Schuur and more. But Dave Brubeck's music was largely recorded and performed in an instrumental format, and the lyrics that Dan's mother, Iola, wrote have remained a lost treasure, until now. Dan wanted to bring this material together in the way that it was originally envisioned-and was delighted to bring this band to the task. You will find that the tunes chosen for this project are drawn in part from the familiar Brubeck playlist, as well as from the deep well of profound compositions in the vaults of Brubeck's diverse musical history. It was not until Dan met bass and vocalist Adam Thomas that the rich and innocent feel of this project came together in full. Click here for more info. Three classy, fun-loving, cheeky ladies seeking your adoration and applause! 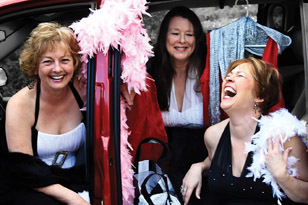 Lynne Dickson, Wendy Hibberd and Patrice Pollack, three experienced Sunshine Coast vocalists, first came together in 2004 to perform as a one-time-only project. The crowd went wild, and so the ladies, who are all addicted to adoration and applause, decided to nurture each other's egos and eccentricities, and Definitely Diva was born. The original three song set has grown substantially into a large and varied repertoire of jazz, swing, blues, Latin, light rock and R&B. 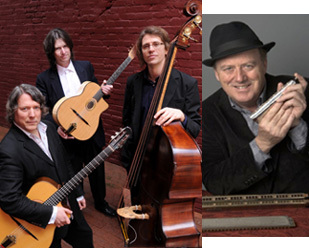 The Van Django Trio (sans violinist Cameron Wilson) is an acoustic string ensemble made up of Canada's most talented and eclectic musicians; guitarist Budge Schachte, guitarist/cellist Finn Manniche, bassist Brent Gubbels. Van Django's music is punchy, driving and rhythmically inventive, combining a wealth of musical influences while maintaining their roots in the gypsy jazz made famous by the 1930's Quintet of the Hot Club of France. Since the group's formation in 1998, they have toured extensively in Canada as well as international forays to the USA, Europe and China. Brad Turner's phenomenal talents as a trumpeter, pianist, drummer and composer make him one of Canada's most in-demand and highly esteemed musicians. Brad has performed and/or recorded with such artists as Joe Lovano, Kenny Wheeler, John Scofield, Michael Moore, Rene Rosnes, Jimmy Greene, Ingrid Jensen, Dylan van der Schyff, Mike Murley, Seamus Blake, Charles McPherson and Michael Blake. Brad's groups have opened for McCoy Tyner, Roy Haynes, Wayne Shorter, Clark Terry, Diana Krall and Tony Bennett. Hailed by the noted Canadian jazz writer Mark Miller as "a kind of Miles Davis, Herbie Hancock and Keith Jarrett all rolled into one,". 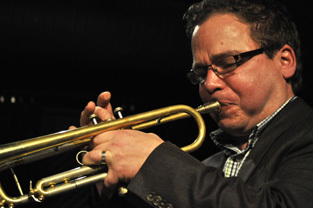 As a leader, Brad has released six albums, five as a trumpeter with his quartet. Orkestar Slivovica is Vancouver's home-grown Balkan Brass band, playing wedding and festive music from Serbia, Macedonia, and other distant and mysterious lands, where it is known as Trubachi and no such occasion is complete without it. The 8-12 piece brass ensemble plays and sings a diverse repertoire, from insanely fast dance tunes to heartwrenching songs, often in crooked rhythms and exotic scales. High-energy modern African music guaranteed to get you moving! Zimbamoto's music offers an exhilarating flavour of African music based on traditional and contemporary melodies and rhythms from Zimbabwe, and surrounding areas. We sing in the Shona language and play with modern Afrobeat sensibility. 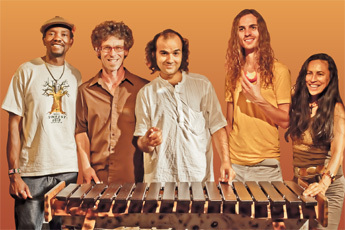 Featuring Kirai Mubaiwa, vocals, mbira, marimba, hosho; Curtis "Sekuru" Andrews, drum kit, vocals; Greg Valou, bass, vocals; Mark Campbell, guitar, vocals; Navaro Franco, hosho, shekere, vocals. JUST THE FUNK - 8-piece hot Motown, R&B, Funk and Soul Band !! Just The Funk is Vancouver's choice soul tribute band. Bringing you classic tunes from legendary musicians like Stevie Wonder, The Temptations and Earth, Wind & Fire, Just The Funk is guaranteed to burn a hole in your favourite dancing shoes. This authentic 10-piece band guarantees you a memorable experience that will have you and your friends getting your shimmy and boogie on all night long. This band is new to the Sunshine Coast and its their first time at Roberts Creek Hall !! Let's show them the real coast dance party experience and see it they can keep up ... or just may be it will be the other way around and enjoy 'just the funk! just the funk fb. Featuring some of the finest jazz musicians on the coast, The Jazz Group of Seven plays the music of the jazz giants from the last half of the last century. With great soloists and fine ensemble work, this is a cookin' band that handles bebop, Latin, and luscious ballads with equal ease. 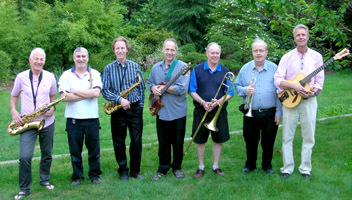 The Coast Group of Seven is: John Frederickson, trumpet; Carl Montgomery, alto sax; Ken Grunenberg, tenor sax; Bryan Airth, trombone; Steve Giltrow, guitar; John Parker Toulson, bass; and Tim Enns, drums. Local favourite, now in her 87th year and as spunky as ever, Nikki Weber and Jacquie Allan present a night of well loved jazz tunes of the past. Special guest for the evening is Michael Creber on piano. Jazz vocalist Jacquie Allan and Wendy Hibbert will be joined by the outstanding rhythm section of Boyd Norman on bass and Barry Taylor, drums. 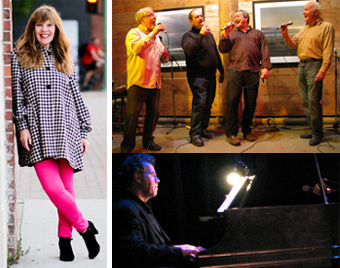 To add even more fun to the night, the 'SH-Boomers', an acapella quartet of Ken Gustafson, Colin Mailey, Mike Weber and Wayne Slingerland will have you boppin and singing along. Sunday Brunch is certainly a favourite with the Jazz crowd, and this year is going to be delicious! Jazz vocalist Laura Crema with Steve Giltrow on guitar. Reservations are strongly suggested (604.886.9414). Come and join friends to take in brunch before crossing the street to enjoy the rest of the afternoon at the free concert in Winegarden Park overlooking fabulous Gibsons Harbour. The Creek Big Band is made up of unpaid volunteer musicians who contribute their time and talent for the benefit of Sunshine Coast music students and audiences. The money earned from their paid performances goes toward scholarships for Sunshine Coast students going on to further music studies, and toward miscellaneous band expenses. Their leader this year is Michael Grice and this year they are graced with vocals by Lynne Dickson. Other members of the Creek Band are: Bryan Airth - trombone, Val Anderson - vibes/keyboard, Lorne Berman - alto sax, Cherry Bolognese - tenor sax, Al Burns - percussion, Gordon Catherwood - trombone, John Frederickson - trumpet, Ken Grunenbertg - tenor sax, Tom Kellough - trombone, Clare Lyle - bass, Jim McGowan - trombone, Walter Martella - trumpet, Carolyn Mitchell - keyboard, Carl Montgomery - alto sax, Bob Newman - trombone, Paul Pedlar - trumpet, Doug Reid - bari sax, Karin Tigert - trumpet, John Tipping - percussion, Bill Wishlow - trombone. 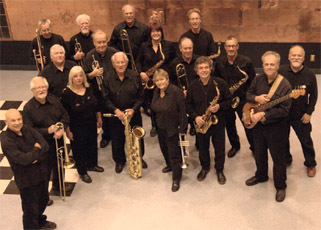 The Creek Big Band is always looking for additional gigs and encourages you, if you want great swing, jazz, and dance music, to book the band for your next dance, party, or other extravaganza. Visit their website at creekbigband.net/bigband.htm. 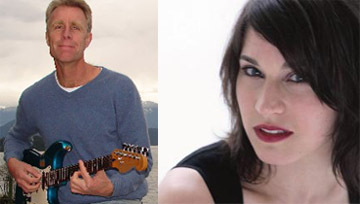 Back by popular deman is volcalist Katherine Penfold and this year she brings with her 2 of Vancouver's best ... Jodi Proznick on bass and Miles Black, keyboard. 2008 Juno Award winner, and Canadian Folk Music Award for World Solo Artists, Celso Machado is a local resident living in Gibsons. 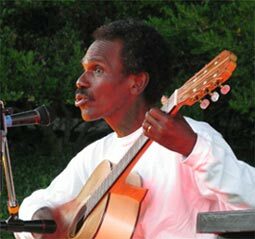 Virtuoso Brazilian guitarist, percussionist, vocalist, multi-instrumentalist,and composer, Celso brings joy to his audiences with his subtle mixture of musical inspiration and irresistible rhythm. For forty years Celso Machado has been performing on concert stages throughout Brazil, Western Europe, Scandinavia, Canada, and the United States and is considered one of the most versatile and exciting musician/composers of Brazilian music today. Celso never stops performing and teaching around the world and has garnered a collection nomination and awards. Back by popular demand the Gibsons Jazz Festival is joining St Bart's Church in Gibsons to present 'Jazz Vespers'. A tradition in many towns and cities, Gibsons now joins the tradition in the fabulous acoustic and spiritual space of St Bart's Church. This year a new vocalist to Gibsons, Brenda Nestegaard Paul will be joined by Ken Dalgleish, piano and Boyd Norman on bass. 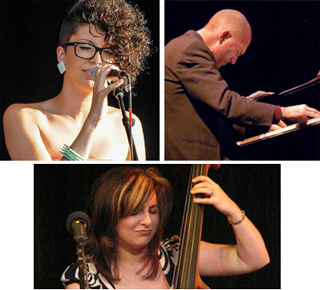 Come out and support this closing show of the 19th annual Gibsons Landing Jazz Festival.